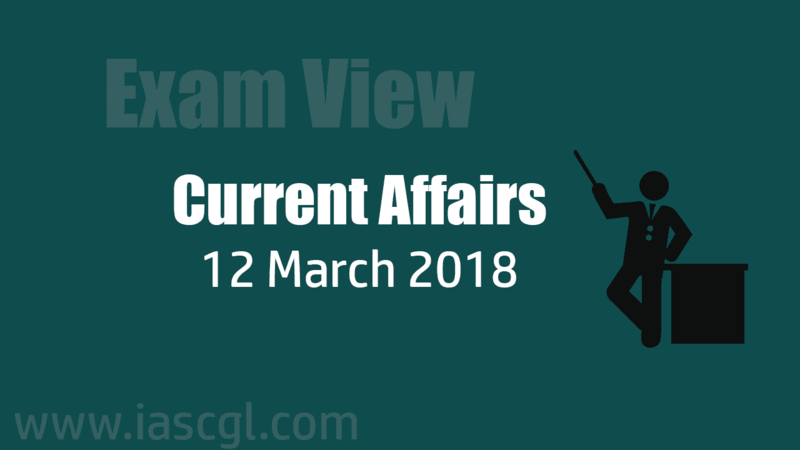 Current Affair of 12 March 2018, Exam View. ISA conference held in New Delhi on March 11, 2018, the conference was co-hosted by Indian President Shri Ram Nath Kovind and visting French President Emmanuel Macron. Aim to generate 175 GW of electricity from renewable energy sources by 2022. Out of 175 GW, 100 GW will be generated by harnessing solar energy. The conference was attended by:23 heads of state, 10 ministerial representatives of different countries, Heads of UN agencies, Presidents of multilateral development banks, heads of global funds and financial institutions and energy-related institutions. International Solar Alliance(ISA): is first treaty based international intergovernmental organisation to be headquatered in India. It is an alliance of solar resources rich countries situated fully or partially between the tropics. The 26th GST Council meeting failed to come up with any conclusive simplification process after deliberating on two models and has now postponed the decision for next Council meeting, but E-way bill will be implemented from April 1. India and France singed 14 agreements in strategic the areas of security, nuclear energy, protection of classified information and also in field of education, environment, urban development and railways. MoU on cooperation in the field of Environment. Letter of Intent for creation of permanent Indo-French Railways Forum. Agreement on cooperation in the field of Sustainable Urban Development. Agreement on Prevention of Illicit Consumption and Reduction of Illicit Traffic in Narcotic Drugs, Psychotropic Substances and Chemical Precursors and Related Offences. Bilateral Arrangement on cooperation in matter of Hydrography and Maritime Cartography. Partnership Agreement on India-France Migration and Mobility . Industrial Way Forward Agreement between NPCL and EDF, France for construction of six nuclear reactors at Jaitapur, Maharashtra. Implementing Arrangement for pre-formulation studies of a Maritime Awareness Mission. Agreement regarding provision of reciprocal logistics support between their Armed Forces. Agreement to facilitate Mutual Recognition of Academic Qualifications. The exercise is being hosted by the Indian Navy under the aegis of the Andaman and Nicobar at Port Blair Command. ‘Milan' was first held in 1995 with the participation of five navies. to expand regional cooperation and combat unlawful activities in critical sea lanes in Indian Ocean region. Theme :‘Friendship Across the Seas’. 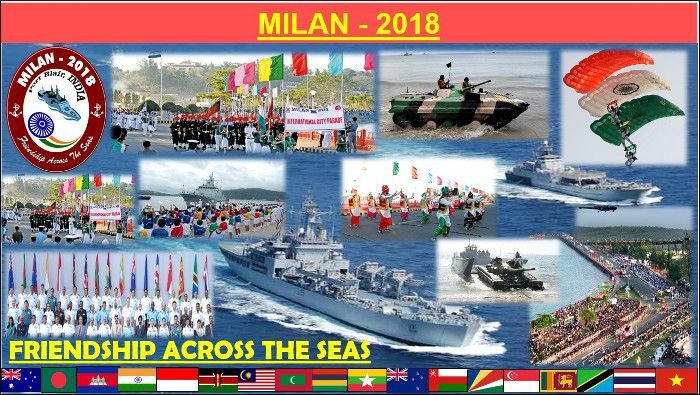 MILAN 2018 held at Port Blair from March 6 to March 13, 2018.